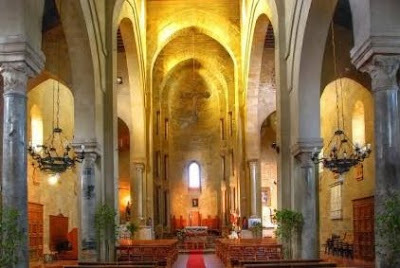 Located in the same part of Palermo as the medieval castles - or fortress-like palaces - of the Steri and Palazzo Abatellis, the Magione, constructed late in the 12th century, is one of the world's smallest basilicas. For centuries the monastic setting, with its splendid cloister, was a commandery of the Teutonic Order. These German knights arrived with the Hohenstaufen monarch Henry VI just a few years after the church was built for the Cistercians. Overlooked by most "tourist itineraries," the Magione is open for most of the day, Monday through Saturday, with mass Sunday morning, and well worth a visit. Read about it in the current issue of our Sicily magazine.